Our inflatables are ideal for just about every event. 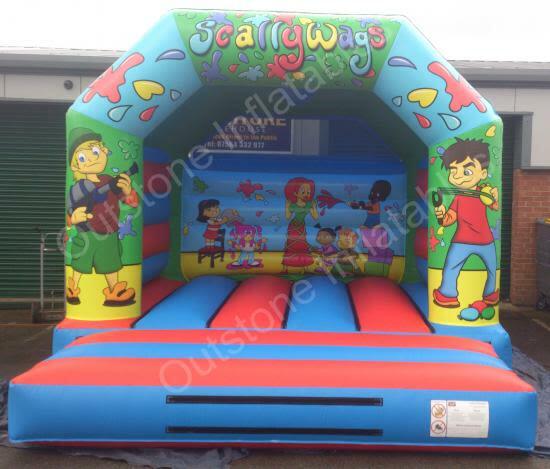 Each of our bouncy castles could be used indoors or outside. For every stress area, our company provide internal and external webbing to reinforce all these areas for added durability. All our units are built to pass, or even exceed, the recent standard BSEN14960:2013. Our posts are actually sewed into the walls making them tremendously resilient and much more robust. Here at Outstone Inflatables, our company only use external independent testers. If you might prefer a RPii or PIPA certificate to accompany your latest purchase, get in touch with us for an estimate. All of our artwork is printed using some of the best sophisticated technology in the business sector. Outstone use solvent ink along with an unrivaled lamination method for consistency, resilience and UV protection. Our team of graphic designers here at Outstone have created some totally magnificent artwork for your businesses. Outstone's product lines are manufactured within the UK by accomplished staff. We only work with 18oz 610 nylon flame retardant PVC which adhere to latest standards. All of the thread used is rot proof and everything is twin sewn. Our step and beds are entirely webbed using 2'inch webbing. Our castles come with detachable artwork fittings, so that you can change your name/number anytime you like. In the event that you want to get a specific theme, why not speak to us today to see if we have it in the pipeline. Do not forget, everything is undertaken in-house so we can be very adaptable in terms of artwork, dimensions and our manufacturing process. We can produce this bouncy castle in any dimension you need. So whats included in the sale? If you need a blower with the castle just add £125 on to the Price.